Muslim American groups have been nearly unanimous in their condemnation of the Paris attacks by IS. But one group - the Republican Muslim Coalition - is calling for tougher action against a group they insist does not represent Islam. Like most other communities across America, Muslims were shocked at the Paris terrorist attacks. Saba Ahmed, a lawyer and president of the Republican Muslim Coalition, condemned terrorists for such atrocious acts. “They have absolutely no basis whatsoever to be targeting innocent civilians in Western countries that are giving them refuge,” said Ahmed. Ahmed said that despite the ferocity of the attacks on the West, groups like IS are primarily hurting other Muslims. “Muslims are the first ones who are affected by ISIL terrorism. They are murdering innocent Muslims in Syria, Iraq, all over the Middle East,” said Ahmed. 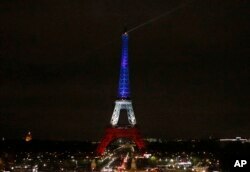 The Eiffel Tower is illuminated in the French national colors red, white and blue in honor of the victims of the terror attacks last Friday in Paris, Monday, Nov. 16, 2015. And, as many have pointed out, she added that groups like IS are not at all representative of Islam. “They have perverted our religion and [they are] criminals that chose to misuse religion teachings to justify their criminal actions,” she said. Ahmed said military action, like the French government's strong response to the attacks, is necessary. “I think that it’s really good that they went off and did massive campaigns in Iraq, targeting ISIS headquarters and strong hold. They have to do whatever preventive measures they can take to disrupt and destroy these networks and hopefully prevent any future atrocities,” said Ahmed. But she said a long-term anti-terrorism plan is still needed. “We have to have a better strategy. President Obama this morning was talking about how we need to reduce their strongholds and fight them comprehensively with all of our allies,” Ahmed added. Ahmed thinks it is vital to reach out to the Muslim communities in the U.S. and worldwide, because she believes they could be a tremendous resource in the global war on terrorism.